A few months ago, a couple of my colleagues suggested that I take a peek at Warhammer 40,000 - a hobby I've been long absent from - because 8th edition rules were quite playable. I do nothing in half measures, so I went after it! My army list is complete, the models are being built, the lore is being populated, and I'm even getting each of these model dioramas illustrated so that they can live forever in glory. TC1: Scout Squad: 4x Sniper Rifle Scouts + Sergeant with Sniper Rifle + Boltgun. TC1: Scout Squad: 3x Sniper Rifle Scouts + 1x Heavy Bolter Scout + Sergeant with Sniper Rifle & Stormbolter. TC2: Scout Squad: 3x Sniper Rifle Scouts + 1x Heavy Bolter Scout + Sergeant with Sniper Rifle & Stormbolter. TC3: Scout Squad: 3x Sniper Rifle Scouts + 1x Heavy Bolter Scout + Sergeant with Sniper Rifle & Stormbolter. TC4: Scout Squad: 3x Sniper Rifle Scouts + 1x Heavy Bolter Scout + Sergeant with Sniper Rifle & Stormbolter. Since I'm starting from scratch with no models (which makes me angry), and the space marine codex is bottom of the barrel (and I like scraping the barrels for my armies), I decided to double down on my fluffy army by tracking down another Dakkanought, Vyler. His original works of art were the inspiration for ME to want to play angry marines here. Here's one of them. I made an impassioned plea that his genius deserved to be paid for, and he agreed to take on his first commission! Here's his WIP Blog on creating the army we're talking about. He finished my Captain (Captain "GrundleCrusher" Irascus) , owner of the legendary Thunderstorm Hampter(tm) - a Stormbolter-propelled Thunderhammer) and is hard at work on my aggressors. Vyler is making these incredible models and dioramas for me to use, but when they're done, he has some pictures of what he did, and some money for his work. The absolute genius behind his angry marine conversion ideas is so incredible to me that I wanted to hire an artist to create illustrations to immortalize his work. I scoured the internet for an artist that could make 40k artwork. I made want ads on reddit.. 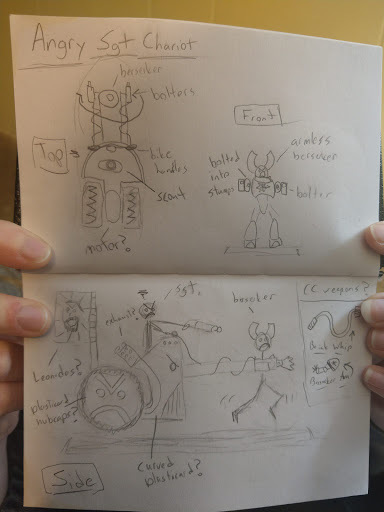 I solicited artists on Dakka. I posted job offers on Deviant Art. Alert: There is a PG-13 word in this illustration which prohibits me from posting the picture to Dakka, so here is a link to the picture! -Every unit in that army list has an equally unique angry marine diorama planned. 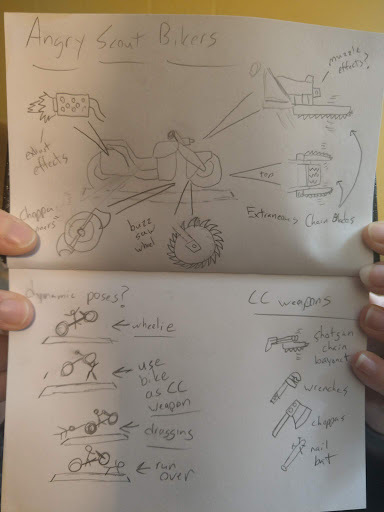 Chris Smoker / Vyler is tracking all of that work at his Dakka blog. -Every unique diorama is going to get a custom-commissioned illustration like the one above. That one cost 80 Euros. -I look forward to my 100% fluffy angry marine army getting tournament ready, then taking my angry marines around the country to reacquaint with all of you! -I am simultaneously having my wife create backup models for these dioramas because "those people" exist. My Scout bikers will be WYSIWYG for weaponry...but they're going to be roman chariots pulled by slaved Khorne berzerkers. When I run into folks who don't like my models, I'll be able to proxy in the regular ones. But in the meantime, PREPARE FOR GLORY!!! I'll keep this thing updated as I get more models, more illustrations, and more backstory done. I've put contact information for both my angry marine modeling commissioner and my illustration artist in here. Spoilers added; I've never used them before. You didn't message me about any artwork. I'm sad now. Heck, I was making Angry Marines before they were a thing. Chaplain T predates them by a few years. They look awesome! Glad it's worked out! I'm still hiring! I've hired a modeling artist for my models, and two artists for illustrations. The artist that made the picture above gave me 5-6 versions of that picture with different backgrounds, and a giant high-pixel 35MB version with a border that can be printed and framed on a wall - which in turn I sent to Hulksmash, who intends to do just that. I have another artist working on my standard bearer illustration (a lot cheaper, but also not as elegant), the first artist is starting to sketch out my scout bikers, and I have another 12-15 of these illustrations to go. Hulksmash says he's going to do the same thing for his custom ad-mech army now that he knows such services exist. This is the first piece of lore that I've completed. There will be illustrations to go with this, and I need to re-order the OP to make room for all of this stuff too. As a reminder, Vyler from Dakka is making all these models for me. The year 203 of the 41st Millennium. Here follows the account of Tempernius Irascus, TechPriest-Captain of the 3rd Company, “EMPRAH’S FUREH," Angry Marines Chapter and the finding of the Thunderstorm Hampter©. “It has come to me, the Thunderstorm Hampter©. It shall be an heirloom of my company. All those who follow my geneseed shall be bound to its fate, for I shall risk no hurt to the GrundleCrusher©. It is precious to me, though I buy it with great rage. The blood along its haft begins to dry. The lubricant oil of Forge Master and Senior tech-priest Anvilus Kustovus, which at first covered this weapon in an oily sheen, has all but disappeared – a secret now that only I can tell. Captain Irascus arrived on this volcanic world of Mezoa in search of Forge Master Anvilus Kustovus, famed artisan of Thunderhammers. Mezoa is a Secundus-I grade Forge World in the Segmentum Obscurus that weathered the storm of traitor legion blockades and invasions by literally tossing kilometer-long sections of hardened magma at incoming void ships hard enough to break them. In the campaign of Mezoa, the shattered legions fought a last, desperate battle to deny Horus its famed resources and slow the traitor march to Terra. It is to this proud world of rich history and faith to the Emperor that Captain Irascus has come; this volcanic and unstable forge world that is home to the Magos, to forge a weapon worthy of smiting the enemies of THE EMPRAH and continuing their proud tradition. Captain Irascus traveled to the tallest peak of the largest volcano, into the Forge Temple of the Tech-Priest he had sought, and was honored to be received by Forge Master Anvilus Kustovus himself. 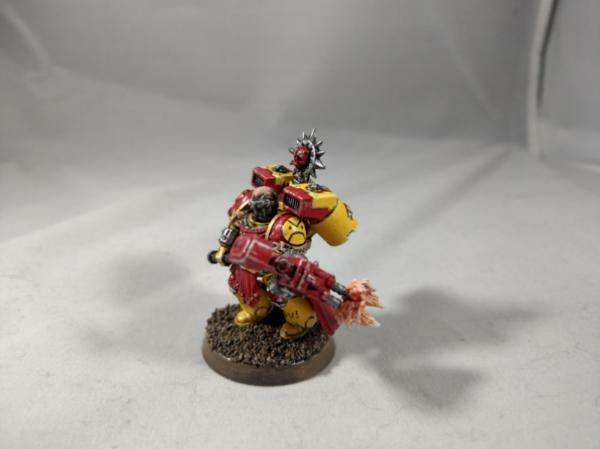 Captain Irascus explained his need – a technological fusion of a storm bolter and a thunderhammer that would let him wield his Thunderhammer in a two-handed grip while maintaining ranged fire superiority. The Forge Master refused. 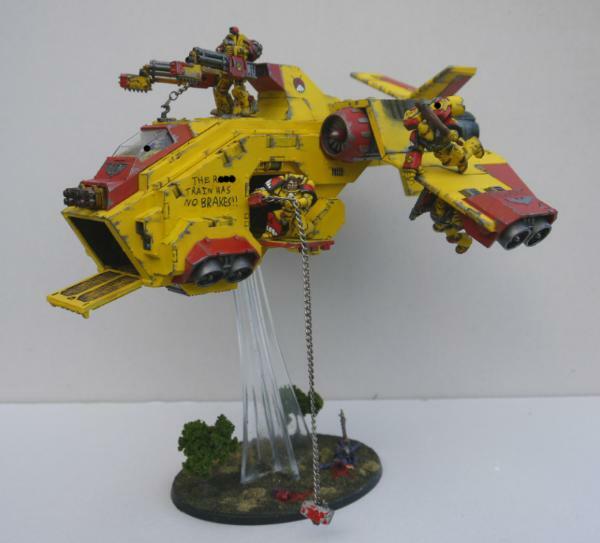 Captain Irascus made an impassioned plea for this weapon – a combi-stormbolter-thunderhammer – a Thunderstorm HammerBolter – as a critical aspect to protect the Imperium and the EMPRAH from heretics. In the Gothic Sector of Segmentum Obscurus, on the Secundus-I grade Forge World of Mezoa, the newly self-appointed Techpriest-Captain Tempernius Irascus forged in secret a Thunderhammer to humble all others – a Thunderstorm Hampter. And into this weapon he poured his anger, his rage, and his unbridled desire to dickpunch heretic and heretek alike. The fallen Forge Master’s forge complex cycled up its defensive weaponry to punish the slayer of their fallen master, but Captain Irascus’s unquenchable fury at the presence of a rogue heretek on a loyal world was beyond reason. One by one the enemies of THE EMPRAH fell to the power of what would become known as “The GrundleCrusher©” as Captain Irascus fought his way out of the forge complex with his newly forged Thunderstorm Hampter©, wearing the cloak of the slain techpriest as a grisly trophy. 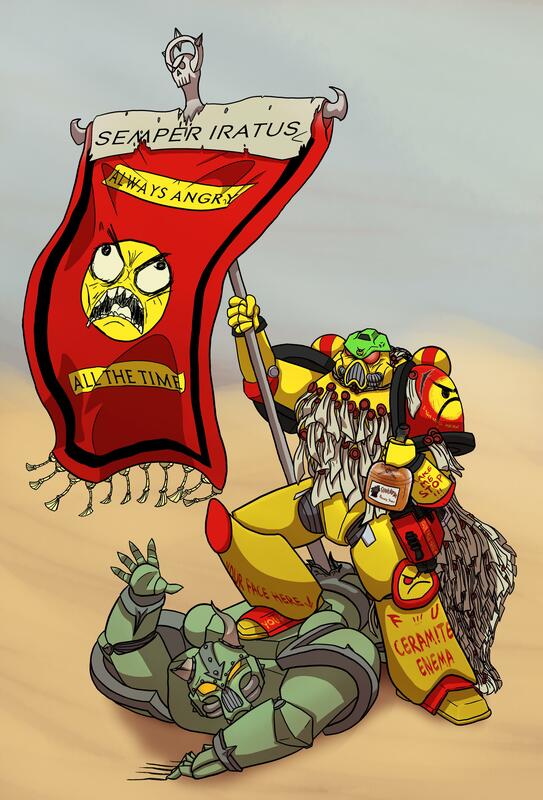 Some have put forth the opinion that Angry Marines don’t wear capes. The only cape wearers are Ultramarine drama queens, Chaos Edgelords, and those emo Eldar sissies. 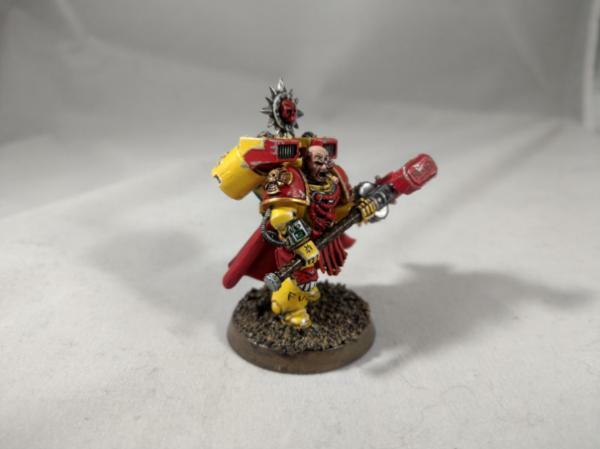 Some have even opined that Captain Tempernius Irascus can't be an angry marine simply by the virtue of him wearing his looted techpriest robe. As Vyler so eloquently stated, that looted Techpriest robe is not a cosmetic affectation, it is doubles as wargear should Techpriest-Captain Tempernius Irascus find the need to strangle a Carnifex with it in a pinch, among other utilitarian features. That techpriest robe *has* been used to strangle things. Wargear Entry: Looted Cloak of "I'M THE TECHPRIEST NOW"
By the time Captain Irascus - the newly self-appointed Techpriest - had broken in his newly forged Thunderstorm Hampter© "GrundleCrusher©" on a bloody path out of the forge complex of the former Magos, the last and greatest defender of the forge complex had prepared to exact bloody vengeance. Irascus paused at the entrance of the forge complex as he realized his looted techpriest cloak had a unique smell. "THIS TECHPRIEST RAG SMELLS LIKE A BROKEN RHINO ENGINE BEING SPREAD ON PLAIN WHITE TOAST!" As he wiped the blood and gore from Gundlesmasher© off on his new cloak, a shadow fell across the entrance. The Dominus-class Knight "Saint Angron's Revenge" of the Questor Traitoris opened fire, spewing death across the volcanic cave opening that housed the entrance to the former Forge Master's complex. Captain Irascus rolled for cover, voxxing an orbital command to his ship to teleport an Angry Marine Launcher to his location. As the teleportation trace flared to a thunderclap of displaced air, Irascus flung himself into the launcher, aimed for the cockpit of the momentarily blinded traitor knight, extended both middle fingers, and kicked the launch pedal. Irascus did a quick mental trajectory calculation, lined up his Thunderstorm Hampter, and with the force of a speeding, bald, Thunderhammer wielding, Jump-pack boosted captain, he swung Grundlesmasher...into the groin of the knight. Metal rent open as Captain Irascus used GrundleCrusher© like a can opener on a can of heresy. Looted cloak still in hand, Irascus literally punched his way through the crotch of the Knight, ripping out wiring, cabling, and the legs of the pilot within before climbing up the torso, wrapping his looted cloak around the Knight's head, and angrily strangling the knight. As the Knight collapsed to the ground, leaking mechanical and biological fluid from the mortal wounds caused by the ball-bashing force of GrundleCrusher©, Captain Irascus bellowed the immortal words of his furious company: SEMPER ING IRATUS!! Armed with his Thunderstorm Hampter and his knight-killing techpriest cloak, Captain Irascus and his third company "EMPRAH'S FURY" maintain the EMPRAH'S VIGILANCE, always prepared to find and fight heresy. Especially with dickpunches. Techpriest-Captain Tempernius Irascus and his Angry Marine stat-lines and wargear can be found here. The Thunderstorm Hampter© made my day. Great stuff. Interestingly, the mods had a conversation about that. This doesn't neatly fit anywhere. * I'm not doing any painting or modeling. The guy painting and modeling these as a commisison for me has a P&M blog, which I've linked 4 times in here. Here it is again. * I've also commissioned some illustrations from two artists not on Dakka (which I've also provided links to) but that doesn't belong in painting and modeling either. I originally thought this thread should go into "40k Background" but illustrations don't fit there because this isn't canon or 40k background. * All the models, illustrations, and lore are tied into my army list - which in turn is the competitive tournament army I'm building. I linked that in the OP too, and brought the final version here. So perhaps this thread belongs in "Army lists" or in "Tournament discussion." That's a bad fit too. There's no neat bucket. It's an amalgamation of a lot of different hobby elements that make up a whole. They decided to leave it here. There's more to come as the artists I've hired produce more content, which in turn...I'll write stories about and centralize their content! I have only one question: Where in Celestine's undergarments do you find all of the coin for such projects? *Dash joined the army straight out of high school! *Dash was a great soldier, and got sent to a great college to become an officer! *Later in his career, Dash got permanently injured, and subsequently medically retired. *Dash still gets his pension and benefits! *Add a successful career in a professional field on top of that! *Dash's wife is also a hard-working, successful professional in her field! *We hate kids, and had none. Kids are expensive too! Couple of hard-working adults, a few revenue streams, and pretty good life choices. I love the 40k universe, but have neither the talent for the hobby piece, nor the time to learn. 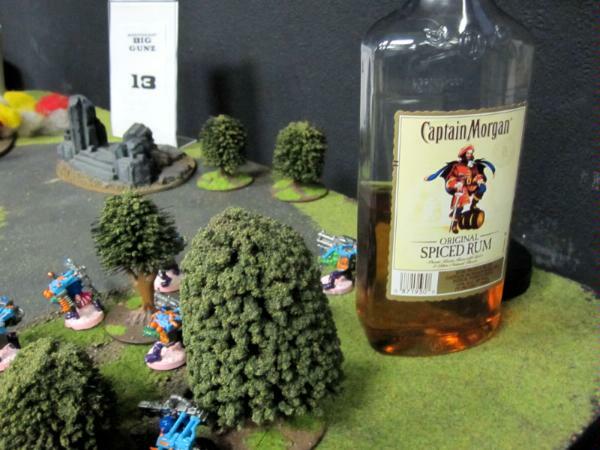 In the very, very limited free time that I have, I want to (1) Drink alcohol while (2) rolling dice and (3) laughing with a friend over the shenanigans of our armies on the tabletop. I'm trying to strip a couple of models right now - scouts for this army. I've 3-4 hours into stripping them, and I've got 2 scouts stripped down to plastic. I could have bought a new box of them for $20; the opportunity cost of what I'm doing...gah. So that's this! I don't have the talent to model, or draw, or paint. But I love the universe, the models, other peoples' creativity, and I'm willing to pay to bend their creative genius to my ends! I kid you not, when one of my two illustration artists finishes their next commission (I have one working on my standard bearer, and the other working on my scout bikers - both of which are ridiculously angry marine over the top scenes), I'm going to dump this lore on them and ask for a comic strip of Captain Irascus becoming a techpriest, punching that forgemaster into toasters, crafting his own hammer, punching a knight in the balls, then choking it to death with a techpriest robe. The saga continues! My next commission has been completed, which is the illustration below. You can see its development if you care in this imgur album. 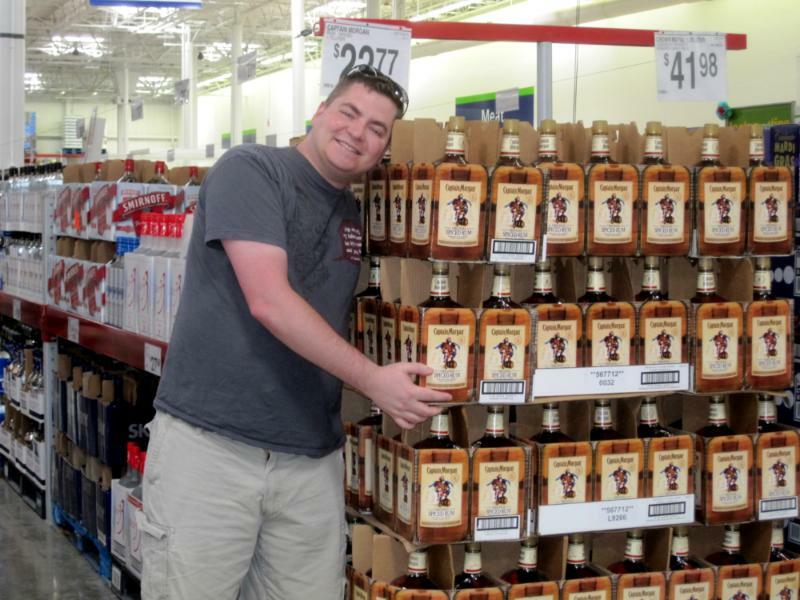 I approve of his taste in Rum. If you look at the source content, you'd know why it's Captain Morgan. Lots of people don't know me by sight, but they walk up to the gamer with the bottle of Captain Morgan and ask if I'm Dashofpepper. PS, your signature is out of control brah.